There's a wind of change happening over here on the blog these days (maybe you caught a bit of it this week)? I hope to announce something later this week, but a part of it is - I'm longing for change. So I'm going to switch things up a bit, not sure exactly how it's all going to go down, but I do sense a longing to return to old times a bit. So today for my sunday reading, as there's so many links out there, and it seems so noisy; I thought I'd direct you to something I'm presently participating in – this online 21 day meditation challenge - if you're interested in joining me - it's free and (I think you can catch up)! I'm hoping to finally learn how to meditate! (Above) I'm kind of in love with this room for the moment. 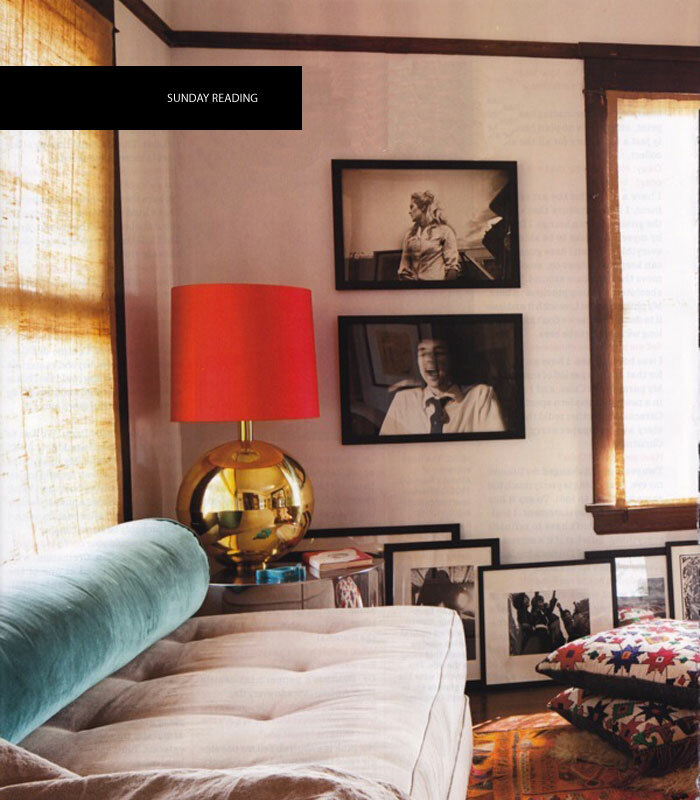 Although it's circa 2010 (Photography: Amy Neunsinger Magazine: House Beautiful) - the colors (and that brass lamp with it's red/orange shade) seem so welcoming in a retro sort of way. Happy Sunday (hope you have a really nice one)! I really love the colours in this room, I've got a bit of a thing for orangey red at the moment and this is perfect! Change is good, I'm excited to see where you go next as I'm sure it's going to be great. I love these ideas! Thank you for sharing. Your photography is inspirational. I also blog about crafting and the family friendly lifestyle at http://forevertogetherfamily.blogspot.com if you are interested. Thanks for all you do! I'm really excited to see where this new (old) direction takes you and your lovely blog, Jan. I am always for returning to 'the good ol days'; and, also for retro-inspired interior like this lovely shot from House Beautiful. Gorgeous. I probably could really use some meditation in my life these days. Good for you for taking the challenge. Thank you. Yes, things have seem noisy lately. I have been wanting to learn to meditate as well. The oprah challenge seems like a great place to start. Heres to trying something new. I love the soft light and the cozy, cluttered feel of the room. Excited for you!